Leo Cullen hopes his players can take lessons from last night’s shock defeat to Benetton moving into the business end of the season. Joey Carbery didn't have the evening he would have liked at out-half. NOT THE WORKOUT Leo Cullen would have envisaged just seven days from the biggest game of Leinster’s season, an off colour performance riddled with mistakes, but at the same time it’s hard to read too much into it in the context of what is to come. Benetton Treviso were thoroughly deserving of a famous victory as the Italians underlined their encouraging progress by dominating the Leinster pack and, through their out-half Tommaso Allan, played some thrilling rugby. Leinster, for their part, were worryingly sloppy and lacked any sort of cohesion or structure, with the forwards failing to deliver quick ball and when it did arrive Jamison Gibson-Park’s distribution was often poor. Mistakes were a common thread throughout, too, particularly in the final quarter when a series of handling errors undermined Leinster’s efforts to find the field position to work their way back into the contest having fallen 17-15 behind. Unlike last week against Zebre, the opposition didn’t fall away after the interval and Leinster were unable to produce a late salvo or rely on a big impact from their bench, as they fell to only their second defeat in 38 home games stretching back to December 2015. All things considered, it’s hard to pick a player in blue who had a good match, notwithstanding the ever-impressive Max Deegan, who was energetic and dynamic throughout while Jordi Murphy worked tirelessly as per. 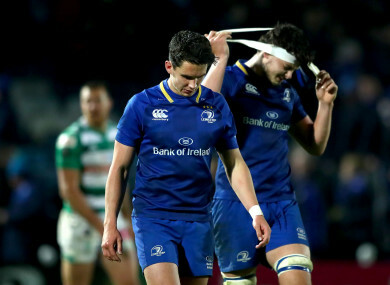 It was a disappointing night for Sean O’Brien, whose injury comeback lasted just 40 minutes, and for Joey Carbery who was given a chance at 10 but never really managed to stamp his authority on proceedings. Instead, it was his opposite number who did that as Allan continued his Six Nations form to score the crucial match-winning try after Jack McGrath’s loose pass had put Leinster in all sorts of trouble. Even still, at 17-12 and then 17-15 after a Carbery penalty, you felt there would be a late rally from the hosts, another act of escapology because they just don’t lose at this place. But there was nothing. Mick Kearney fumbled a lineout, Barry Daly grounded a pass out left and Leinster were left to rue at least half a dozen kickable penalties they had turned down over the course of the 80 minutes. Benetton, riding high under Kieran Crowley and emerging as a real force this season, struck back instantly after Richardt Strauss had opened the scoring and although they conceded a try just before the break, scored two of their own in the second period through Federico Ruzza and man-of-the-match Allan to secure a historic win. “Very direct in terms of the way they were playing and they’re also quite good at holding width as well,” Cullen continued. “We sort of weathered a bit of a storm, getting that try before half-time but then lose our way at the start of a second half and give away a couple of cheap scores, breakaway scores. A disappointing night then as Leinster suffered just their fourth defeat of the season, and while several players were shown up, Cullen hopes it will be a good learning curve for his squad. “We had a number of young lads out there and it’s a really good, painful learning for them,” the head coach added. “Really, really painful but that’s the nature of the game. Email “'We had a number of young lads out there and it's really, really painful learning for them'”. Feedback on “'We had a number of young lads out there and it's really, really painful learning for them'”.